Three decades have passed since the world came together to answer a distress call from Antarctica—thinning of the ozone layer or formation of “ozone hole” over the region. The layer, located in the lower stratosphere, contains high concentrations of ozone and absorbs harmful ultraviolet rays. Ozone depletion thus generated worldwide concern over increased risks of skin cancer, sunburn, cataract and other harmful impact on plants and animals. These concerns led to the adoption of Montreal Protocol in 1987, which called for curtailing the production of stable compounds involving chlorine or bromine, such as refrigerants like chlorofluorocarbons (CFCs) and hydrochlorofluorocarbons (HCFCs), and halons used in fire extinguishers. But has the protocol, dubbed the most successful international agreement to date, managed to protect the ozone layer? The answer, latest studies show, lies in the gray area between yes and no. Ozone Hole Watch, database of the US National Aeronautics and Space Administration (NASA), shows that the minimum ozone concentration over Antarctica plummeted to the lowest in 1994. By 2016, it increased by 56 per cent but was still 41 per cent less than the concentration measured in 1979—the year when minimum ozone concentration over Antarctica dipped for the first time below 220 Dobson Units. (One Dobson Unit is the number of ozone molecules required to create 0.01 millimetre-thick layer at 0oC.) Without the protocol in force, the size of the ozone hole in 2013 would have been 40 per cent larger, a May 2015 study published in Nature estimates. 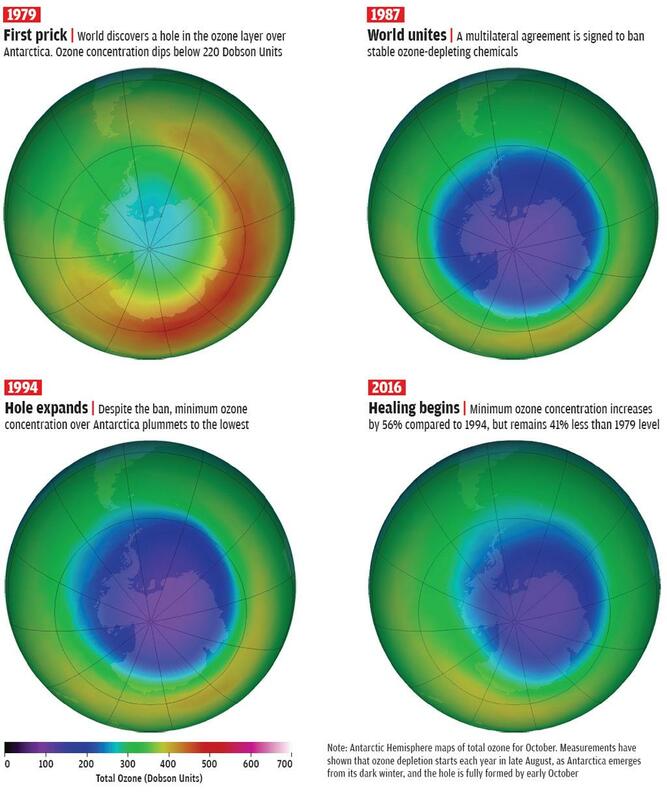 Analysing the compounds banned under Montreal Protocol, Global Ozone Research and Monitoring Project Report of the World Meteorological Organization estimates that the ozone hole will completely heal between 2046 and 2057. But a study published in Nature Communications in June 2017 warns that the healing process might get delayed by another five to 30 years—until the end of the century. The study further blames the delay on short-lived, ozone-depleting substances that still remain scot-free. One such is dichloromethane (DCM), a common industrial solvent. Initially, the scientific community was of the view that DCM cannot pose a threat to the ozone layer as it mostly remains concentrated in lower atmosphere and has a short life span of five months before it is broken down by photochemical reactions. But the assumption was busted in 2015, when Emma Leedham Elvidge from the University of East Anglia, England, examined air samples taken on board commercial aircraft cruising at the lower edge of the stratosphere. She found high levels of DCM, particularly over the Indian subcontinent and Southeast Asia and during the monsoon when strong updrafts, or upward air current, take the compound to the stratosphere where ozone layer is located, she notes in the August 2014 issue of Atmospheric Chemistry and Physics. The concentration of DCM has doubled in the atmosphere since 2004. The other factor that damages the ozone layer but remains unaccounted for is volcanic eruptions. A research published in the July 2017 issue of Geophysical Research Letters has analysed the impact of volcanic eruptions on ozone. It has been known that aerosols resulting from volcanic eruptions can damage the ozone layer in the presence of compounds, such as CFCs. Whereas, they add to the layer in the absence of such compounds. Based on the amount of ozone-depleting compounds spewed into the atmosphere before Montreal Protocol came into force, researchers had estimated that volcanoes will become ozone enhancers from being ozone destroyers anywhere between 2015 and 2040. But the new research says this transition will be achieved after 2070. “Previous estimates did not take into account natural sources of halogen gases, such as very short-lived bromocarbons originating from marine plankton and microalgae,” says Eric Klobas, lead author. Under these circumstances, the 30th anniversary of the Montreal Protocol celebrated by the UN in mid-September should not be only about patting its back but also about the new threats that ozone layer faces.